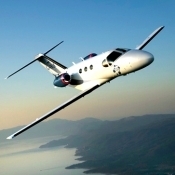 Fly on demand, one way between London and Geneva (in either direction) with 3 or 4 passengers and limited luggage. Blink is Europe's first air taxi service. Blink delivers all the benefits of personal air travel at prices competitive with commercial business class and up to 50% less expensive than existing private jet services. Â Blink is working with Hub Culture to offer private shuttle services between the London and Ibiza, Cannes, Copenhagen, Berlin, Paris, Zurich and Geneva. Details: * Price is all inclusive for a one way flight with up to 4 passengers * Flights are on demand but subject to airport opening hours, availability and other restrictions * Payment can be made in Ven but payment by bank wire is also available through the pavilion valets * All flights are subject to Blink's standard flight terms & conditions which will be sent to you upon purchase * Blink's London airport is London Blackbushe but other London airports may be used.